At first glance, liquid cooling looks simple. Liquid is pumped through a cooler, it absorbs heat, and it's cooled back down with a radiator. But because you're working with liquid, the design principles become more complicated. Obviously, you don't want the system to leak. This is a more common concern to those new to liquid cooling. In actuality, it's a rare occurance. Hose clamps used internally are a precaution in Koolance systems. Each device is designed to fit snugly with the next, and although not recommended, systems generally run fine without being clamped. Anyone who has installed a Koolance system quickly realizes the amount of sheer physical stress a typical hose connection can withstand. Koolance components are also pressure-tested at many times their operating rate during the manufacturing process. For example, air is injected into the radiator at 70 times (7kg/cm2, 100psi) the normal running pressure to certify it from leakage. 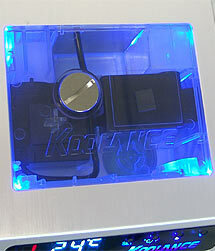 Koolance user manuals provide instructions on testing each cooling system prior to placing any hardware into the chassis. This allows customers to validate the work they have done on nozzles and tubing arrangement before operating the computer. 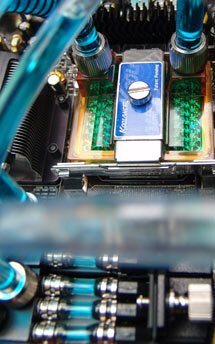 The pump is a liquid cooling system's "heart". In conformance with that analogy, a similar effect can happen to the system if this component were to fail. This doesn't mean it is necessary for a liquid cooling system to use a $200 pump. It only means you can not use any off-the-shelf aquarium pump and hope it continues to operate for months and years under computer cooling conditions. Different pumps are used in Koolance systems, depending on the thermal application. All models are specifically tested for long-term use, with reliability generally exceeding 30k-50k hours MTBF (3.4 to 5.7 years of continuous 24/7 operation). Let's assume something does go wrong. A motherboard cooler was installed, but the tubing got folded during installation of a new video card. There is almost no liquid flow, which is similar to the effect of a dead pump. The CPU is heating up, the liquid is absorbing the additional heat, but slowly, the liquid temperature begins to increase. With a regular liquid cooling kit, this situation could result in a dead computer. 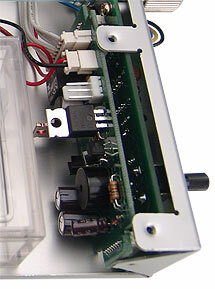 Koolance systems, however, have built-in hardware safety features. Once your liquid temperature reaches a configured level (for example, 50°C/122°F), an alarm sounds. If you're not there to hear or see it, the system can shut off power to the computer automatically. There are multiple types of chemical reactions that can be present in a cooling system that uses liquid. The most common is galvanic corrosion, caused by different metals in an electrolyte (in this situation, water). These varying electrode potentials can create a "battery" effect, damaging the anode metal. Using domestic tap water can encourage corrosion. Tap water contains numerous trace elements that can accelerate this process. This is the reason distilled water should be used (not "purified", "de-ionized", or bottled drinking water). Koolance's liquid coolant features many additives combined with water: anti-corrosives, anti-biology, and other chemicals that are commonly used in the engineering field to help avoid reactions. Koolance coolant is renowned for its extended time between replacement (2-3 years).